This is my dad's favorite island I think. He has been coming here for 20 years and has lots of friends here. I like the beach here. It's long and shallow. We stay in the Stavros hotel. My dad took this picture from our balcony.That little red blotch that looks kind of like a person is me and my mom taking a walk on the beach. 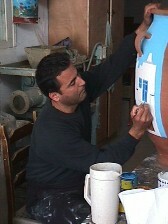 This is my friend Adonis the famous potter. He lets me help him make pottery sometimes. He had 4 little kittens that I loved to play with. These are the almond cookies that are famous on the island. They are made of almonds and sugar and my parents eat them all day long. My dad says he can live off these. They say Sifnos has the best cooks in Greece. 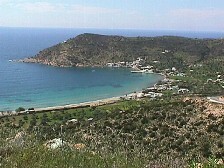 This is Chrysopigi where we go to swim sometimes. It is really an island. A long time ago some girls were running away from some pirates and they ran here and prayed for a miracle. Suddenly there was an earthquake and the land split and water seperated the girls from the pirates. Then the pirates got scared and ran away. This is Vathy where we stay sometimes. You can go by boat or by car. When we stayed here we lived in a church with no electricity. My dad went snorkling and caught fish every day. 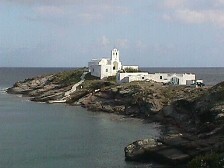 Sifnos has 365 churches. They are everywhere. Some big some small, some on the sea and some on the tops of high mountains. 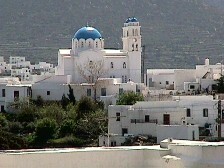 Kastro is the oldest village on the island. This is the main street. Stick close to your parents because you can easily get lost here but it is small so they will probably find you again.